Bulletin Board Sets are sure to bring any room to life. With the brightest colors, individual designs and variety of styles, the choices are endless. 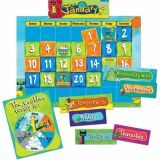 Everything needed to create a giant classroom calendar, with month headings, dates and additional squares containing illustrations that highlight special days. 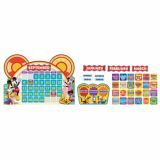 Best of all, the whole set features the Mickey Mouse Clubhouse® characters! 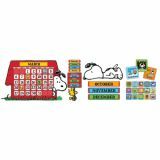 The Peanuts gang can be part of your classroom with this fun calendar set that incorporates two different Snoopy poses. Includes Giant 34" x 24" Calendar, 12 month headings, 35 dates, 54 special day markers and more. 112 pieces. Pete and his friends help students track the days of the week, special days, and weather throughout the year! Includes 23 3⁄4" x 17 1⁄2" calendar grid, 9 1⁄2" x 12" weather chart, 33 date cards, 30 special day cover-ups, and more. 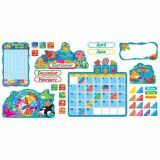 Includes 17 1/2" x 23" calendar, weather graph, weather spinner with 2 arrows, season sign with 4 labels, separate topper, 33 numbers, 12 month labels, 45 special days, blank sign, and Yesterday, Today, Tomorrow sliders. 105 pieces.